Earlier this week, we (meaning the dogs & humans living here) had some excitement in the backyard. The excitement started when Jill hit, no pounced, on the back door to go outside. Both she and Samson started some serious barking and jumping. I looked outside to see what all the excitement was about and it was a BIG PORCUPINE!!! Instead of opening the door to let them out because electric fence or not I believe they both would have gone after that prickly rodent in our yard, I locked the door and called out to my husband. (I think Jill would have gotten the door open) My husband took out his shotgun and played Elmer Fudd, except he didn’t want to hunt “wabbits”, he just wanted to scare away the porcupine. Porcupines seems to march to their own drummer, so when the shotgun was discharged over the porcupines head, all it did was raise his quills and continue plodding it’s way into a bush on the side the woods. 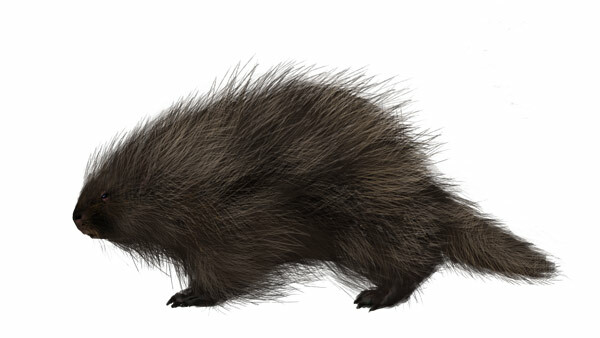 Porcupines must be stupid or extremely confident to act so nonchalantly when a shotgun is shot at them….. I have always thought of elephants as the gentle giants of the animal world. Turns out, if you live alongside them in Africa, they can often be the opposite of gentle: destroying crops and pushing over trees in their effort to get enough food to power their massive bodies. Farmers and researchers in communities in Africa have long sought a way to limit elephants’ destructive tendencies in a way that doesn’t compromise the elephants’ well being. They seem to have found it, and are now steering one of the largest animals on earth away from damaging behaviour by harnessing their natural reaction to a very small animal: African bees! Elephants are terrified of these particularly relentless insects, specifically because they can fly up their trunks and sting them from inside. So they will quickly evacuate an area where they hear the sound of an active beehive. This has led farmers and community members to put up hives along elephants’ routes towards tasty crops — when the bees are disturbed, they buzz, and the elephants turn right around! Similarly, as conservationist and National Geographic Emerging Explorer Paula Kahumbu explains in this video for the venerable magazine, elephants are also repelled by the bee-like sound of drones. So drones can be used to “chase” elephants away from places they can damage — as well as from the resulting conflict with humans that could end up injuring them. I love how nature and low-impact technology is being used to help these beautiful, intelligent creatures live their lives, as they battle back from the terrible effects of poaching. There’s a lesson for humans in here too: there are ways to work with many animals, if what they’re doing harms our way of life.